Get your friends, family or colleagues together to celebrate an event or build team morale. 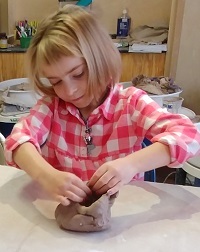 Whether it's for your son's 12th birthday, your daughter's bachelorette party or your team's holiday gathering, a clay party will give your group an experience to remember. 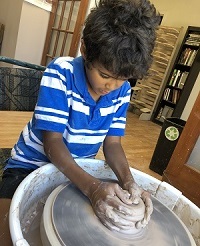 At a Magpie3x3 clay party, guests will form pieces from soft clay by your choice of potter's wheel or hand building techniques. The party duration is 1.5 to 2 hours, including decorating, cake time and clean up. Party host is welcome to decorate the studio prior to guest arrival and serve cake, food and drinks. Wheel Parties Guests each take a potter's wheel for a spin. With instruction, guests learn how to manipulate clay and begin forming shapes. Each guest will get to keep one of their pieces and select a color for glazing by our staff. Maximum 10 guests. Hand Building Parties Guests use coiling or pinching methods to form pottery. Guests will glaze their own piece during the party. Maximum 15 guests. All parties - work is fired and ready to pick up within 3 weeks. Price $260 includes 8 guests. Additional guests (up to maximum) $25 each. $100 non-refundable deposit due at time of booking. Availability includes weekends and weekdays; mornings, afternoons and evenings. Short notice booking may be available, but one week or more advance booking is preferred. To book a party, please call 502-919-8992 for scheduling.